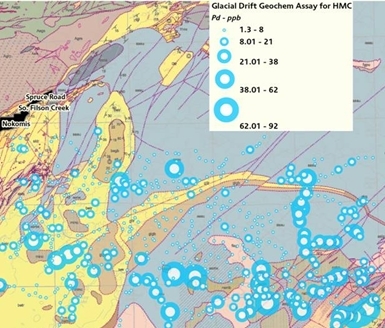 FORWARD This regional geochemical orientation and reconnaissance survey report for a portion of Lake County, Minnesota, has been made possible by the Minnesota Legislature's determination to promote a diversification of Minnesota's mineral resources base. With a favorable recommendation by the Minnesota Minerals Coordinating Committee and financial support provided by the Legislative Commission on Minnesota Resources, this non-ferrous metallic mineral investigation has been conducted by geologists and technicians in the Minerals Division of the Department of Natural Resources. Bedrock in the four-hundred square mile study area is dominated by mafic intrusive rocks of the Duluth Complex, long known to host occurrences of copper, nickel, magnetic iron and titanium. Mineral exploration by mining companies for these metals over the past forty years has confirmed the existence of several mineral deposits of varying size and significance, but none have yet passed the economic tests for development and production. Comparisons with similar intrusive bodies worldwide have suggested potential within the Duluth Complex for mineral deposits containing chrome, cobalt and platinum group elements (PGE's). The first platinum mineral identification was made in 1983; and a narrow, ore grade concentration of PGE's was identified in archived drill core that was re-examined in 1985. Despite the attractive geological setting and mineral assemblage, this study area remains largely unevaluated and underexplored due to a general blanketing of bedrock by glacial drift that has a complex history of deposition. 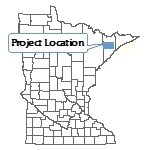 The locality provides an excellent opportunity for the application of a regional scale geochemical survey, using a variety and combination of evaluation techniques that have not previously been used in Minnesota. Analytical data that has been generated will constitute a large, new source of information to all who have interest in the mineral resource potential for this part of the Duluth Complex. It is hoped that the descriptions and discussions of the geochemical techniques applied to this study will stimulate and encourage wider use of these tools for mineral evaluation and exploration activities elsewhere in Minnesota. Part I: Glacial Drift Geochemistry for Strategic Minerals; Duluth Complex, Lake County, Minnesota. Part II: Glacial Drift Geochemistry for Strategic Minerals; Duluth Complex, Lake County, Minnesota. Part III: Analysis of Opaque Oxides in Partial Heavy Mineral Concentrates from Glacial Drift Samples, Lake County, Minnesota. 2Univeristy of Minnesota Duluth, Center for Applied Research and Technology Development, Natural Resources Research Center. Element Contour Maps 1 - 62: Glacial Drift Geochemistry for Strategic Minerals; Duluth Complex, Lake County, Minnesota. Plate 1- Sample Location Map: Glacial Drift Geochemistry for Strategic Minerals, Lake County, Minnesota. Plate 2- Bedrock Geology Map: Glacial Drift Geochemistry for Strategic Minerals, Lake County, Minnesota.. Plate 3- Glacial Geology Map: Glacial Drift Geochemistry for Strategic Minerals, Lake County, Minnesota. Listed below is a zip file of the original tabular data in asc file format and the converted GIS data of sample and assay data for Report 262, Glacial Drift Geochemistry for Strategic Minerals; Duluth Complex, Lake County, Minnesota. In addition to the above mentioned data files are the georectified plates that can be displayed in GIS software packages like ArcGIS. The data is designed to be used as a supplement to the report and plates. Metadata for these data files is provided in the zip file as well as below.